They were echoes of people wanting to be anywhere but here. The light from the near transparent disco ball dappled the walls with a hazy light. Miranda observed the clusters and cliques, some by the shadow of a dessert table, others holding their fingers around non-existent wineglasses or tumblers, taking a sip in between words. She couldn’t hear the words. She was alone, arriving early to the party. Charly had to run an errand in town, first. The Luna was the swankiest restaurant in Hendersonville. The wood-paneled walls and huge unnecessary fireplace, never lit even in winter, took up one wall in the elegant white table cloth dining room. Behind it yawned the long hallway and a red door to the Victorian Room for private parties. Once it had been booked two years in advance. It’d been the spot to have a wedding reception or a holiday party in town. Until the night of fog that blanketed the highway. The particulate from the paper mill mingled with water vapor from the humid, cold night to make drivers blind to each other. Her stepmom said she’d tried to drive that night and barely gone a block before parking in someone’s driveway and walking back home. She’d tripped down the sidewalk, sure she’d been transported somewhere out of time because everything was a dim white wall around her. She couldn’t make out houses, yards, or street lights. A thick blanket of opaque whiteness covered everything. There were two dozen fatalities on the highway that night. And seven of them had been going home from this party. The smudges of their selves remained here. They should have been in their cars, reliving the horrific crashes, trapped in the mangled and twisted metal, the accordions of wrecks unrecognizable as automobiles. But Miranda’d never seen a ghost on the highway. Maybe accidents happened too fast. The rubber in the asphalt might ground them. Or maybe this was the last place on their minds when they died. And so they were stuck in festive jollity unable to move on. They were unable to move past the sparkling decorations, the inane chit-chat, or the forced laughter at snide punch lines. They were echoes of people wanting to be anywhere but here. After the night of fog, the Luna’s business hadn’t suffered, per se, but no one booked the private room anymore. It was uninviting, cold, and creepy. Even if they didn’t see the dead like Miranda, the customers sensed them somehow. People felt the wasted life, the remnants of memory trying to crowd them in the room. Her uncle offered Charly a job as a waitress part-time on the weekends. And she’d heard them, the echoes of thumping party music, the snatches of conversation and fake laughter as Miranda picked her up to go to the movies last week. Charly’d made a reservation for them and asked her uncle to seat them in the private dining room. Miranda had arrived early to watch the smudges. She’d spent the weekend at the library searching through the newspaper microfilm to find the story and googled the rest. She didn’t mind the quiet specters but their waitress had disappeared, not checking on her once as she waited for Charly. Miranda smoothed the napkin in her lap. A woman in a blue wrapped and belted mini-dress flung her long brown hair over a shoulder. The ghost turned then and looked right at Miranda. Charly laid her hands on her shoulders. The sound of the party blared in her ears, cutlery and conversation loud but undercut by 70s disco music. The room brightened, the circuit she and Charly completed opening the scene like a portal. Charly gasped above her. Miranda tilted her head up to find Charly looming over her. One of her hands left her shoulder as she sat, the other grasping Miranda’s fingers in her own. Charly smiled at her and Miranda knew a goofy answering grin lifted her lips. Charly’s face glowed in the candle light above her dark red blouse. She would look stunning in a turquoise dress. “Too expensive for me.” Charly squeezed her fingers. She looked at the porcelain plate in front of her. She was probably right. Her stepmother shopped at expensive boutiques, some of them even in Europe. Miranda nodded. She’d buy Charly the dress anyway. She liked her in mini-skirts. “Here they come.” Charly’s hand clamped hers and the warmth of her palm turned clammy. The smudges ringed their table now. The woman in the blue dress spoke first. Miranda and Charly listened to all of them, all the fears, the needs, the regrets that poured from the mouths of the dead. And at last they quieted, the flood of words reduced to a trickle of a sob from a woman in the back. “All of your cars.” Miranda glanced back at the hallway beyond the door, but the waitress hadn’t come back yet. “But I’m a good driver.” A young man crossed his arms over his chest and glared. “There’s nothing left for you here. 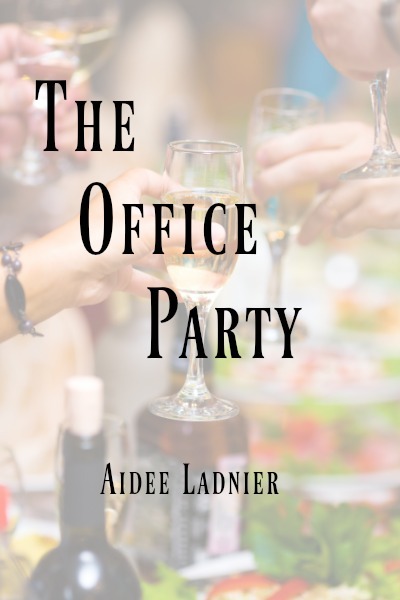 The party is over.” Miranda observed the smudges looking at each other. She motioned with her free hand and the grandmother grasped it. Her hand was biting cold. The woman turned to the angry young man and held out her hand. He took it. And soon all of them were linked. The woman in the blue dress reached for Charly’s hand. Charly smiled at her, taking it. Light brightened in the middle of the circle and one by one the smudges melted away. The last one, the woman in the blue dress, looked back at the dessert table and turned as if to return to it. But she faded, going transparent and then winking out of existence mid-step. Miranda and Charly sat in an empty room. Charly stretched her fingers and unclasped their hands, leaving Miranda’s palm cold and damp, alone. Charly took a deep breath and then grinned. “Now that that’s done, who’s supposed to be taking care of us? I haven’t even gotten water yet.” She scraped back her chair and disappeared into the hallway, heading for the main dining room. Miranda slouched back in her seat. She scanned the elegant flocked wallpaper. She should recommend the Luna for her stepmom’s next ladies auxiliary meeting. Copyright 2016, Aidee Ladnier. All rights reserved.